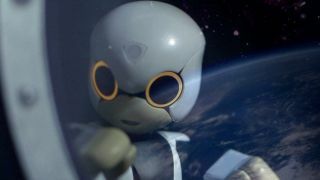 Kirobo will take part in the first robot-to-human conversation with veteran Japanese astronaut Koichi Wakata when they are both onboard the space station in December 2013. Kirobo will launch on Aug. 4, 2013. Image posted June 27, 2013. Japan will launch a new cargo ship with tons of supplies — and one small, talking robot — toward the International Space Station on Saturday (Aug. 3), and you can watch the liftoff live online. The fourth unmanned H-2 Transfer Vehicle, or HTV-4, is scheduled to blast off from Tanegashima Space Center in southern Japan at 3:48 p.m. EDT (1948 GMT; 4:48 a.m. Sunday, Aug. 4 Japan time). You can watch launch coverage on SPACE.com here beginning at 3 p.m. EDT (1900 GMT), courtesy of NASA TV and the Japan Aerospace Exploration Agency. Kirobo was put through a series of zero-gravity and other safety tests before it was deemed ready for flight. Image posted June 27, 2013. Kirobo is expected to speak with Japanese astronaut Koichi Wakata, who is due to launch to the International Space Station later this year in November. It is one of two robots built by the University of Tokyo's Research Center for Advanced Science and Technology as part of the Kibo Robot Project, which seeks to develop new technologies for robot-human interaction for long space missions. Both robots are equipped with voice-recognition technology, face recognition, a camera and emotion recognition and natural language processing. The Toyota Motor Corp., Robo Garage and the public relations company Dentsu Inc. are partners in the project. "I want to help create a world where humans and robots can live together," Kirobo said when asked what its dream is by an official from Toyota Motor Corp., during the Kibo Robot Project's press unveiling in late June. The project's second robot, called Mirata, will remain on Earth to aid project engineers if problems develop with Kirobo in space. Kirobo is due to return to Earth in December 2014, project officials have said. HTV No4 is moved into place for payload fairing encapsulation on July 11, 2013. In addition to Kirobo, JAXA's HTV-4 is carrying about 3.5 tons of supplies, food and equipment for scientific experiments, which the crew of the space station's current Expedition 36 will offload when the cargo ship finally arrives on Aug. 9. The HTV line of spacecraft is also known as "Kounotori," which means "White Stork" in Japanese. The supply vessels are about 33 feet long by 14.4 feet wide (10 by 4.4 meters) and can carry 6 tons of supplies to the orbiting lab. Like Europe's robotic Automated Transfer Vehicle and Russia's unmanned Progress spacecraft, HTV vehicles are built for one-time use. Once these spacecraft have delivered their cargo, space station astronauts fill them with trash and send them off to burn up in Earth's atmosphere. That's in contrast to SpaceX's reusable Dragon cargo capsule, which is designed to splash down in the ocean and be retrieved by boat-borne crews. California-based SpaceX has successfully completed two resupply missions to the station using Dragon and its Falcon 9 rocket, and the company will make 10 more such flights under its $1.6 billion contract with NASA. NASA also signed a $1.9 billion deal with Virginia-based Orbital Sciences Corp. to make eight flights with its robotic Cygnus spacecraft and Antares rocket. Cygnus — which is expendable like the HTV, ATV and Progress — is slated to launch toward the space station for the first time in mid-September. Saturday's launch will mark the fourth space mission for the Japan Aerospace Exploration Agency's HTV program. HTV-1 launched in September 2009, HTV-2 took off in January 2011 and HTV-3 blasted off in July 2012.